Hands down, the one book most people recommend for learning PowerShell is Learn Windows PowerShell in a Month of Lunches by Don Jones and Jeffrey Hicks. You can buy the 3rd edition from Amazon or directly from Manning. This book even comes with its own YouTube series, featuring author Don Jones. There’s also a website called More lunches but it hasn’t been updated since 2014 while the most recent version of Learn Windows PowerShell in a Month of Lunches was released in 2016. Once you’re comfortable with PowerShell, check out the PowerShell Cookbook by PowerShell Team member Lee Holmes and Windows PowerShell in Action by PowerShell Team member Bruce Payette and MVP Richard Siddaway. The PowerShell Cookbook provides “recipes” of solutions, but I like that it’s also useful for learning best practices. Lee’s code is great to learn from! PowerShell in Action tells an amazing story and discusses the “Why” in-depth. 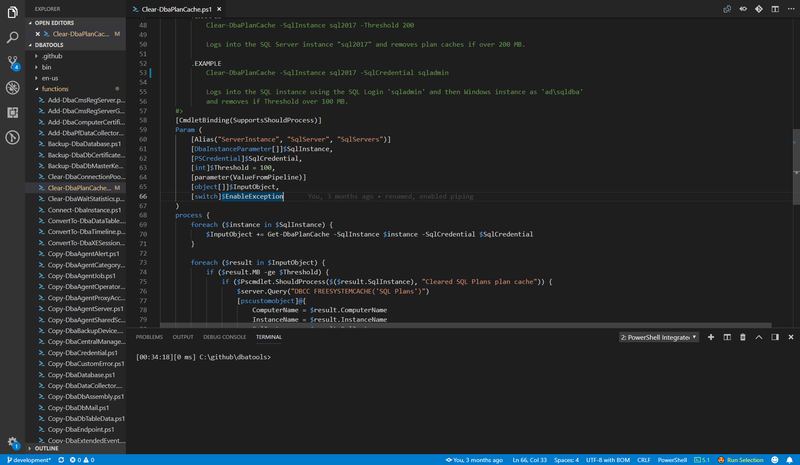 Just skip everything else and use Microsoft VS Code with the PowerShell extensions. You can also share your screen with colleagues using Visual Studio Live Share. You may notice that I still use the ISE for demos, but that’s because it has a ▶ button and the ISE is very stable. Last time I tried to use Code for a demo it bombed out and the last thing I want to worry about during a presentation is my IDE crashing. So for now, I’m using ISE for demos. I’ve heard the newer versions of Code are more stable, so now I’ve just gotta make the time to give it another shot. Microsoft Virtual Academy has a few solid PowerShell videos, too, like Getting Started with PowerShell 3.0: Don’t fear the shell and Advanced Tools & Scripting with PowerShell 3.0: Get Started. Note that this is for PowerShell 3 but it’s still relevant as dbatools is designed to work with PowerShell 3 and above. You can also watch videos from the PowerShell + DevOps Global Summit 2018 as well as PSConf EU 2018. And, of course, the regularly scheduled PSPowerHour which is “like a virtual PowerShell User Group, with a lightning-demo format, and room for non-PowerShell-specific content.” Eight community members give a demo each PowerHour. PWSHSchool is all about gaining/sharing experiences. Join in to learn about PowerShell interactively, by using PowerShell! Microsoft Docs is updated regularly, easy-to-read, and useful. There are a ton of PowerShell User Groups across the world! Check out PowerShell User Groups on Technet. Hope that helps those of you looking to get started. If you have any suggestions for this list, please let me know.